Hi everyone. It's Wednesday and that means its time for a new challenge at Mark's Finest Papers &Stamps. And, I'd like to add that I was thrilled to be offered the chance to be the hostess of these Simple Salutations challenges. Come on and try them, you'll love them and there is a chance to win some awesome stamps from Mark's Finest Papers &Stamps. 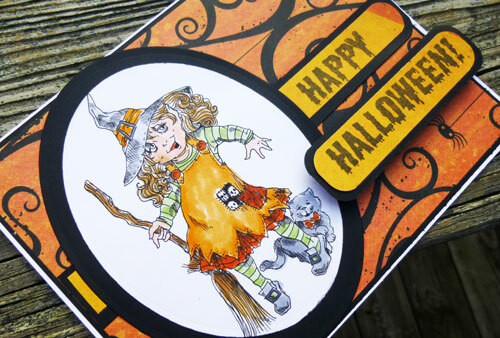 This week's Simple Salutations Challenge #69 is all about Halloween. For today's Cornish Heritage Farms post, I'm using the Baby Basket digital image which I colored with assorted Copic Markers. This image makes a beautiful card for a new baby or even a Christening or Baptism. I placed a doily under the image and popped the image on top. It's almost Fall. Can you believe it! The feel of the cooler air, the morning dew on the grass, the light breeze during the day. I love it!!! We haven't had a bad summer, but I am so ready for fall. 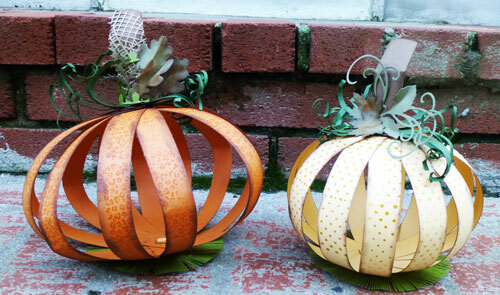 So, what about creating some pumpkins and getting ready for the change of seasons!! I shared this post recently on the Clearsnap blog. 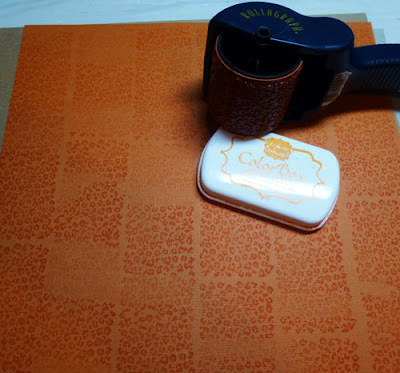 Using a Rollagraph Wheel and Tangerine Ink, ink a sheet of 12" x 12" cardstock. Ignore the imperfections in the rolling as this makes for a very unique pumpkin. 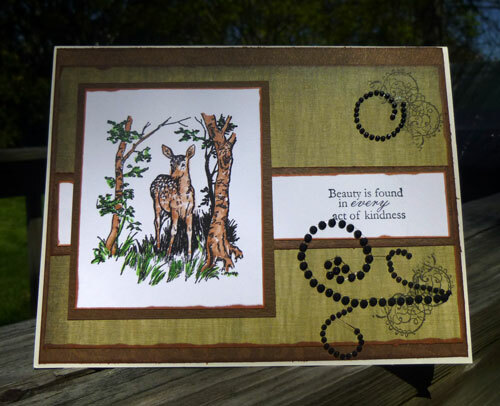 Cut into 12 - 1" strips and ink all edges with Chocolate Ink. 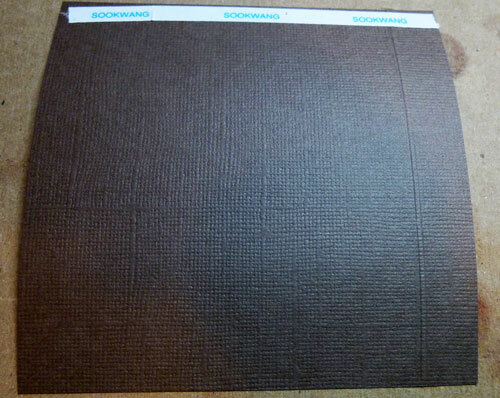 Cut a second sheet of cardstock 10" x 12". Using the Simple Dots Rollagraph Wheel, Ink cardstock with Mustard Ink. 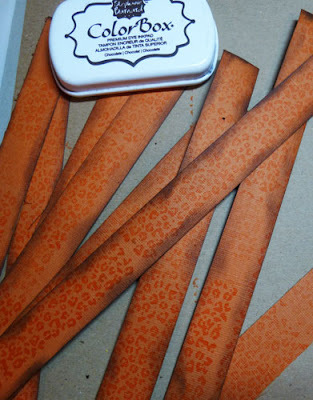 Cut into 12 - 1" strips and ink the edges with Chocolate Ink. Punch a hole in the top and bottom of each strip, about 1/2" from the edges. 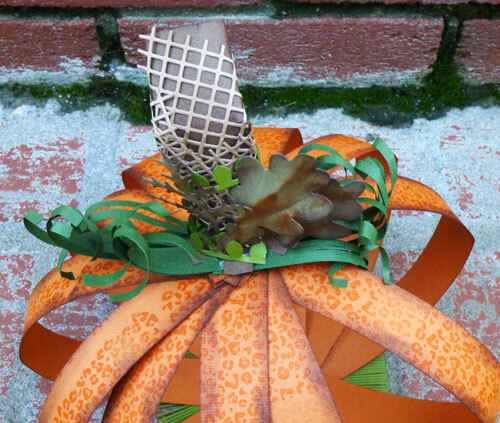 Add the brads then gently fan out the strips to create the desired pumpkin shape. Die cut a large circle from chipboard for each which will be used as the base. 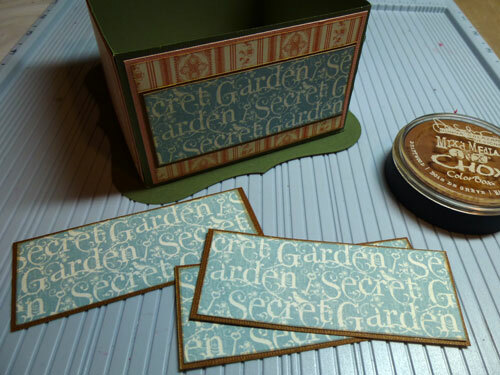 Die cut green cardstock and adhere to the chipboard. 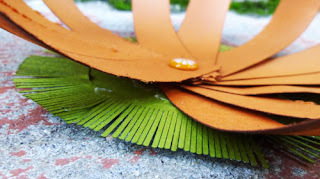 Die cut the Fringe ----- die twice for each pumpkin and adhere around the base. Add Scor-tape to the center of the circle and adhere the pumpkin on top - redistributing the strips until you like the way it looks. 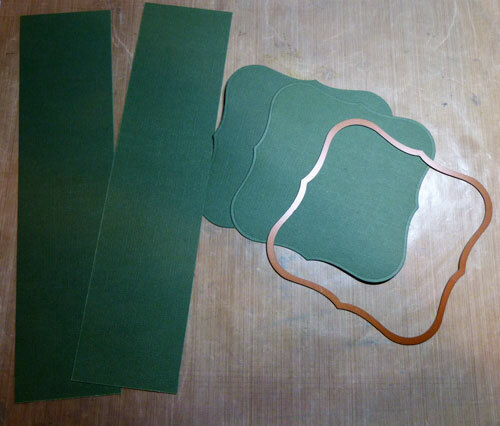 To create the curling strips, cut 2 pieces of green cardstock each 2" x 8". 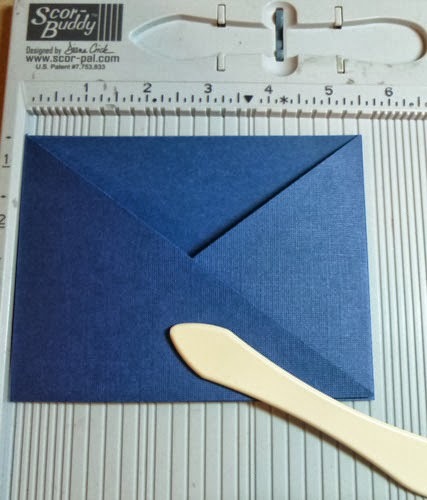 Fold in half creating a 2" x 4" piece and punch a hole in the folded end (about 1/4" from the edge). 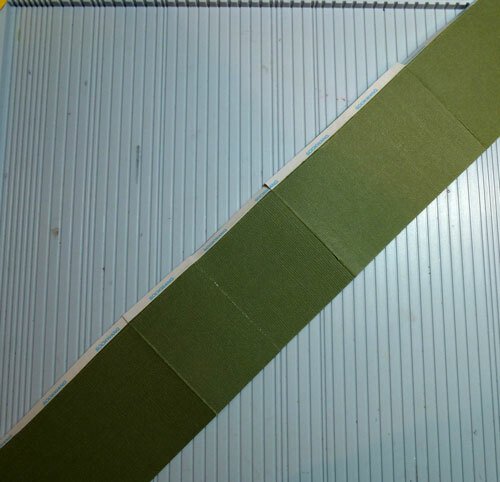 Cut down the green piece creating thin strips. Roll each strip around a thin tool until you like the way the strips appear. Open brad and place the curling strips in place. Score 1/2" along the short edge then add Scor-tape to the long edge and adhere. Gently fold and ink with Chocolate Ink. Cut up the scored lined and add Scor-tape. Adhere to the top of the pumpkin. 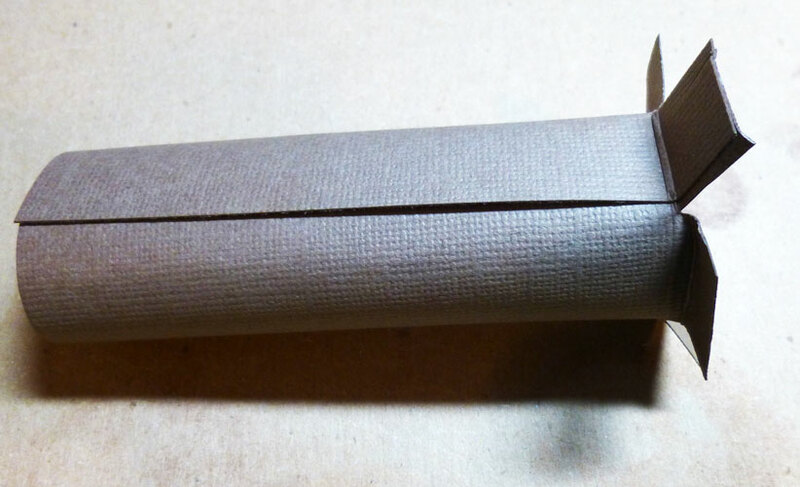 Using Burlap die, cut from tan paper and wrap around the handle. Add additional leaves as desired. 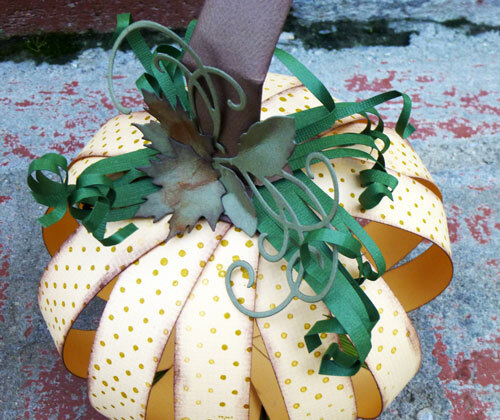 Decorate the smaller pumpkin with additional dies. This is definitely a fun and creative project to create. 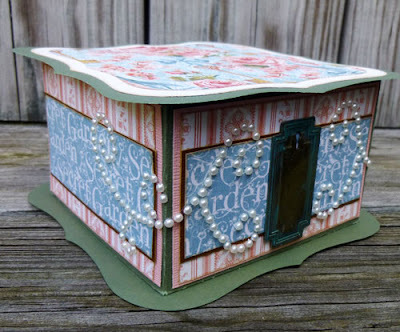 Why not take out some scraps and create some today!! Good morning everyone, I thought I'd post a sneak peak of my first creation as a design team member for Basically Bare. I used a really fun mix'd media album with all kinds of different pages, some awesome Authentique papers and my favorite Clearsnap Chalk Ink. You can see the full album and instructions here. Hey everyone, it's a new challenge at The Crafters Challenge Blog. 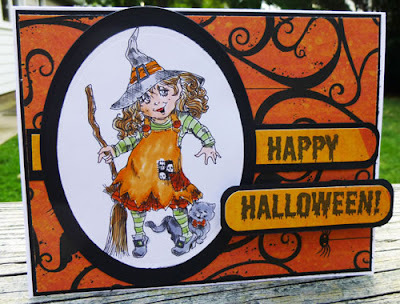 Today our sponsor is Rick St. Dennis and the challenge is to create something spookable. Copic Markers. Spellbinders dies were used around the image. Happy Halloween was stamped on coordinating pattern paper and matted with black cardstock, then added to the card with foam adhesives for dimension. This week's Simple Salutations Challenge #68 is all about fall. 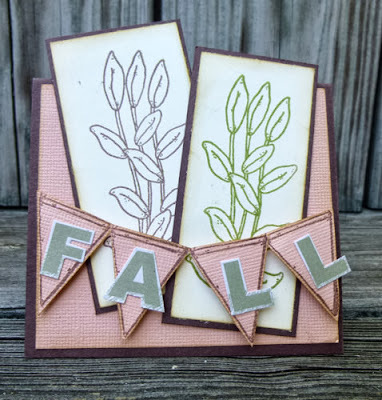 I used Be Virtuous for the leaves, stamping them in 2 different colors. 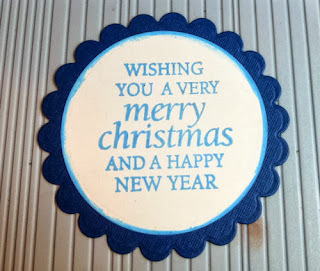 Then used Tailgate Party for the banners, fussy cutting them and adding to the card with foam adhesives for dimension. Good morning everyone. For today's challenge at Cornish Heritage Farms, Kristine has provided a sketch for us to use. I found this lovely Flower Steps Digital Image and knew it would be perfect for this challenge. I embossed a sheet of pink cardstock for my card base, then cut a strip of green cardstock to place on top. 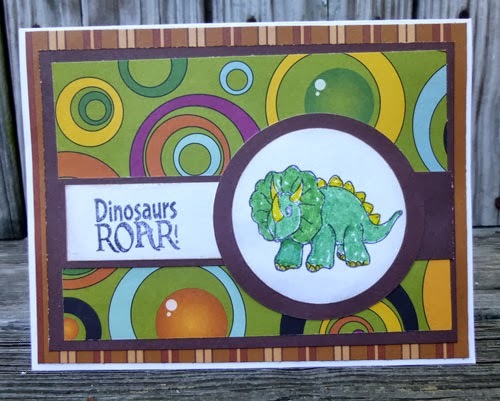 The image was printed on white cardstock, colored with Zig Markers, then die cut into a circle and matted on a piece of dark brown cardstock before adding to the card with foam adhesives for dimension. 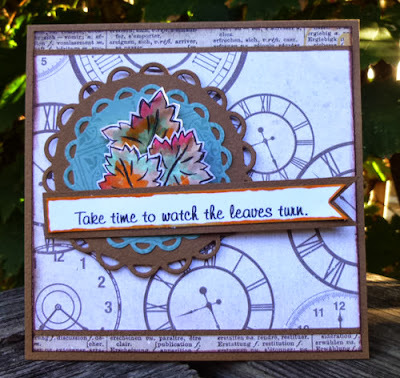 The sentiment is from Script Essential Expressions, which was stamped with brown ink on a scrap of green cardstock and embossed with clear embossing powder. Good morning everyone, Steph here today. 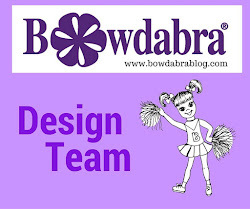 This week Scor-pal and Graphic 45 are working together to create some wonderful projects for you. 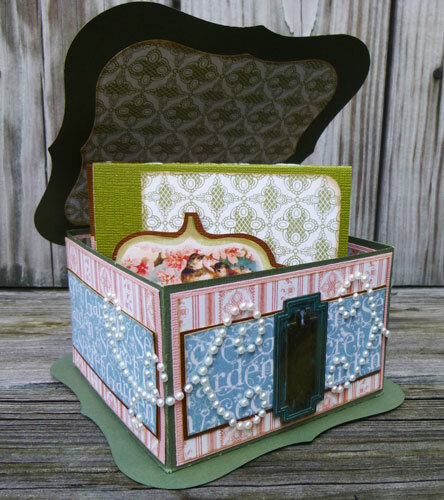 Using Spellbinders Grand Calibre Label Dies, die cut two pieces of green cardstock. Cut 2 strips of green cardstock 3" x 12". 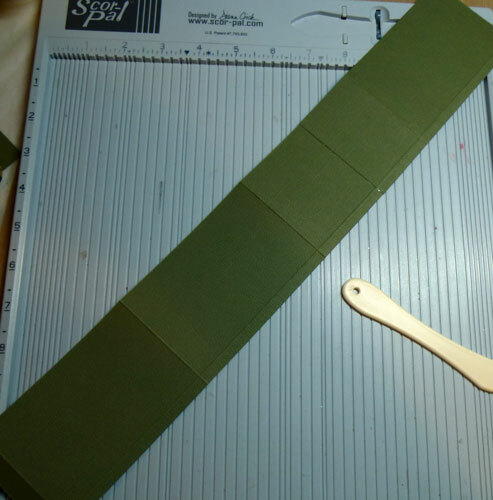 Adhere the 2 strips together to create one continuous strip and then cut it down to 17 1/2". Rotate the strip and score at 4 1/4". Rotate the strip vertically and score at 1/4", turning the strip to finish scoring. Add Scor-tape to the length of the vertical strip. Snip through the tape to the vertically scored lines (these will create the shape of the box). Adhere the ends together to create the box sides. 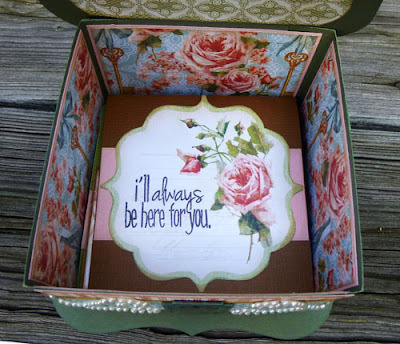 Center over one of the die cut labels and adhere to create the box. Cut pink cardstock 2 1/2" x 4". Cut pink pattern paper 2 3/8 x 3 3/4". Cut brown cardstock 2" x 3 1/2". 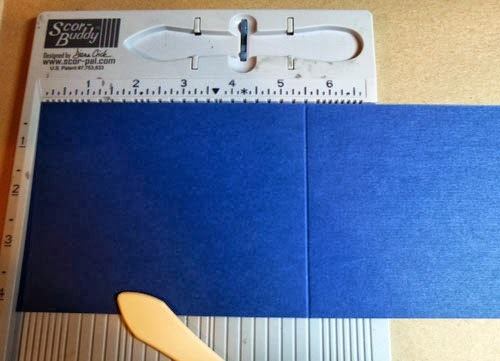 Cut blue pattern paper 1 3/4" x 3 1/4". 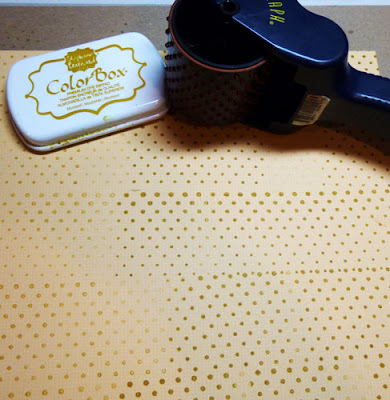 Ink all edges with Clearsnap's Chox Ink in Sparrow before assembling. 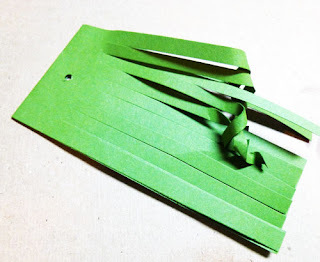 To create the "hinge", cut green cardstock 3" x 3" and score in half. 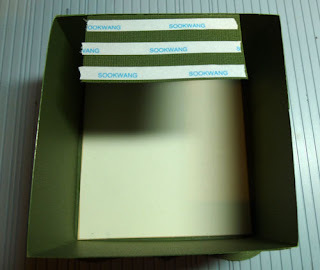 Add Scor-tape to one half and adhere inside the box. Add Scor tape to the top half. Center the second green die cut on top of the "hinge" and adhere. 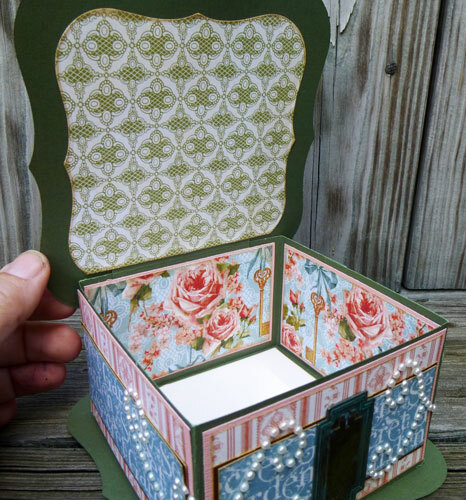 Using several different sized dies, cut white cardstock and pattern paper to finish the box top, inside and out. Adhere a Graphic 45 keyhole to the center of the front using ScraPerfect's The Best Glue Ever. Add Want2Scrap bling around the key hole letting it flow around the sides. Cut white cardstock 4" x 4" for the bottom. Now let's create some cards to go inside the box. Use left over scraps to create assorted cards. 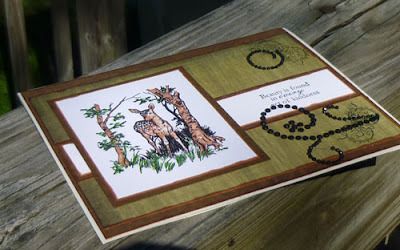 Cut cardstock 8" x 4" and score at 4" to create 4" x 4" cards. Add strips of cardstock across the center of each. Cut apart elements of the pattern paper and ink edges with Clearsnap's Chox Ink in Sparrow. 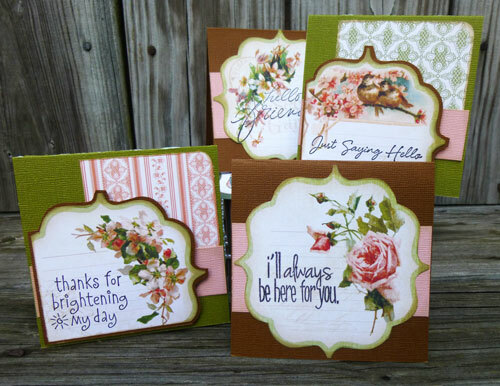 Stamp assorted sentiments on each using ColorBox Wicked Black Archival Dye Ink. The cards are a perfect fit. Wouldn't this make a great birthday gift set or perhaps a Mother's Day gift set? I've got some thrilling news to share. 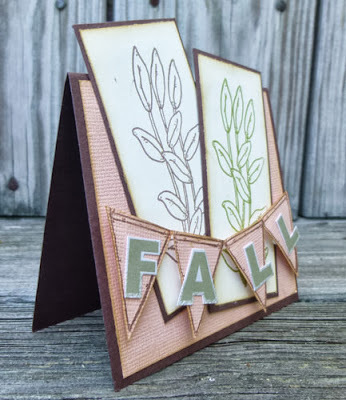 I am a new designer for Basically Bare, a manufacturer of awesome chipboard books and elements. 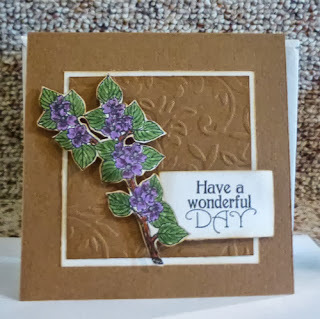 Good morning everyone, today I am sharing my first post for The Stamp Doctor. I am thrilled to have been selected as one of their new EMTs. I colored the leaves with Copic Markers, then fussy cut them to display on the card. I then mounted them on S4-293 Lacey Circles with foam adhesives for dimension. The sentiment was the perfect addition across the leaves. 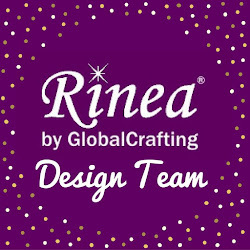 Thanks for stopping by today and be sure to carefully check out the store - there are so many wonderful products available. Hi everyone. It's Wednesday and that means its time for a new challenge at Mark's Finest Papers & Stamps. And, I'd like to add that I was thrilled to be offered the chance to be the hostess of these Simple Salutations challenges. Come on and try them, you'll love them and there is a chance to win some awesome stamps from Mark's Finest Papers & Stamps. 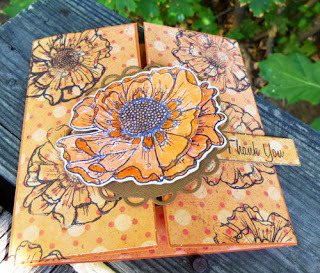 This week's Simple Salutations Challenge #67 is thinking of you - so I used Lotus Blossoms and Works of Art. 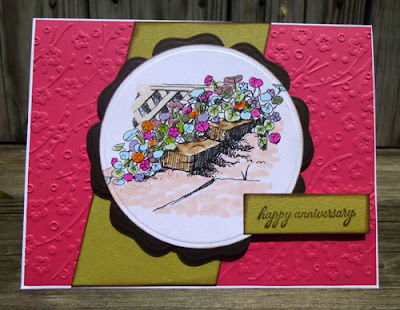 The background is a Sizzix Embossing Folder. The flowers were colored with Zig Markers. Hi everyone, it's a new challenge at Oozak.com and we'd love to see your friendship themed creations. I love this Art Impression stamp and knew it would be perfect for this week's challenge. I colored the friends with Copic markers and used some lovely paper from Webster's Pages. Thanks for stopping by and don't forget to stop by the Oozak blog for more inspiration and to enter the challenge. Good morning friends. Have you checked out the stamps available at Cornish Heritage Farms yet? This awesome Woodland Scene is a digital image from Cornish Heritage Farms. I colored the image with Zig markers and added several stamped elements from Ornamental Beauty around the right side. Some black bling added a little pizzazz to the card. The sentiment is also from Ornamental Beauty. Hi everyone. It's Wednesday and that means its time for a new challenge at Mark's Finest Papers & Stamps. And, I'd like to add that I was thrilled to be offered the chance to be the hostess of these Simple Salutations challenges. Come on and try them, you'll love them and there is a chance to win some awesome stamps from Mark's Finest Papers &Stamps. This week's Simple Salutations Challenge #66 is all about flowers - so I used the Huge Blooms set. 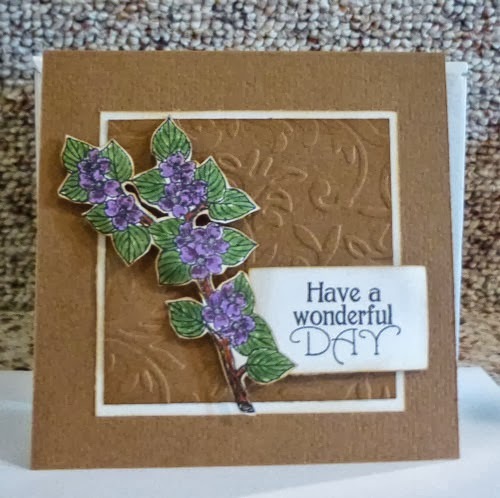 After selecting my background papers, I found it was too plain so I stamped the blooms on the pattern paper creating my own background. Using my Scor-pal, I created a tri-fold card, adding the pattern paper to each panel. 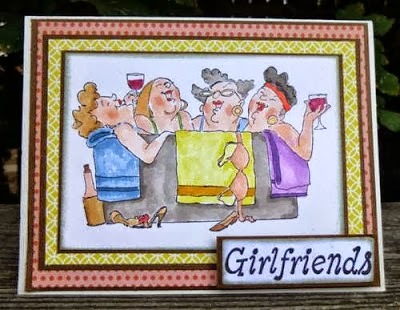 Then I stamped the image again and fussy cut it for the front of my card, coloring with Zig markers. 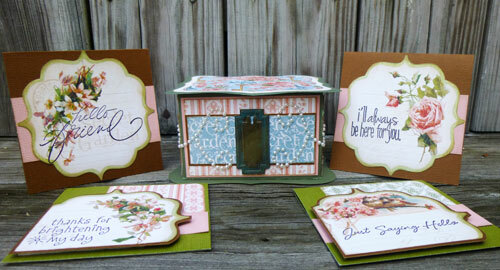 Thanks for stopping by today and don't forget to pop by the challenge blog and enter your card for a chance to win. 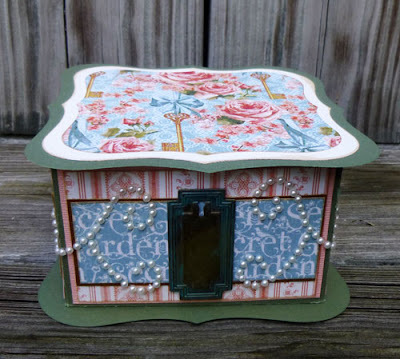 Hey everyone, it's a new challenge at The Crafters Challenge Blog. Today's sponsor is Eureka and the challenge is to use a favorite something. 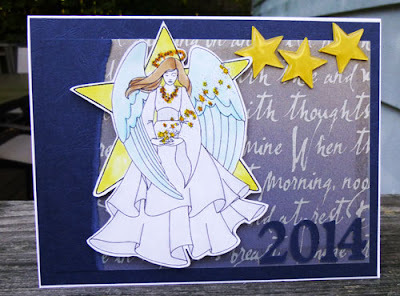 The papers from the Papertemptress were the perfect backdrop for this Angel. I used the Epiphany Star tool to create the bubble stars and my Cricut to create the year 2014. This would be a perfect New Years card, don't you think? 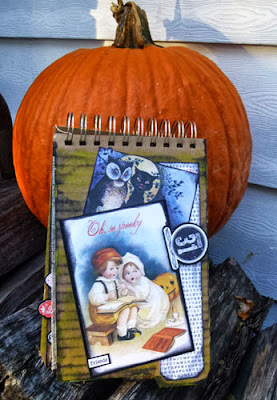 It's a new challenge at Cornish Heritage Farms, and Anne has asked us to create a Halloween/Fall project. I found this wonderful digital image in the store and knew he'd be perfect for this challenge. 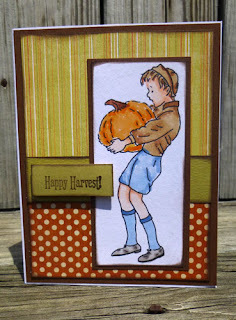 The image is Boy With Pumpkin and I've printed it larger than normal so that it is the focal point of my card. Then I colored him with Copic Markers. The sentiment is from the Fall Harvest rubber stamp collection which contains 18 different fall themed stamps. 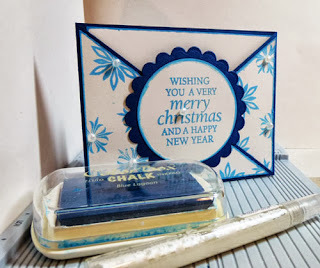 It was stamped with Clearsnap's Chestnut Ink and then embossed with Clear embossing powder. 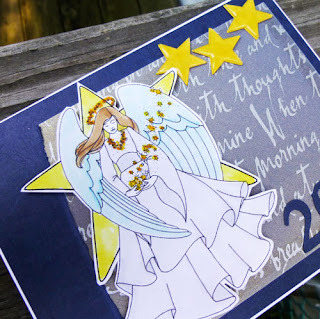 Ink, stamps, foils, and glitter… yeah!! We love card-making here at Clearsnap so our Creative Team decided to throw a card-making party today, during World Card Making Day 2013! 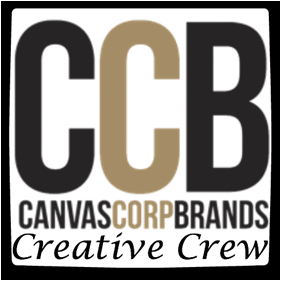 Hop through the list of our Creative Team’s blogs, check out their fab projects, and then leave a comment on each blog post. We have TWO prizes up for grabs!! To enter to win an assortment of Limited Editions Cat’s Eyes, comment on each blog in the hop. To enter to win the Rollagraph and Inkpad Assortment, use the rafflecopter widget on the Clearsnap Blog. This envelope card is definitely a favorite of mine to create. It can be used for so many different occasions. Instead of just handing family and friends a gift card or some cash for the holidays, why not place it inside an envelope card created especially for that individual? They will love it. 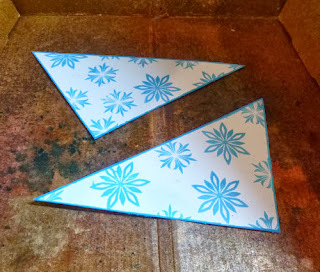 Start by cutting 2 pieces of cardstock 4 1/4" x 11"
Score each piece at 5 1/2"
I am a messy spritzer, so the Clearsnap Color Catcher comes in very handy!!!! 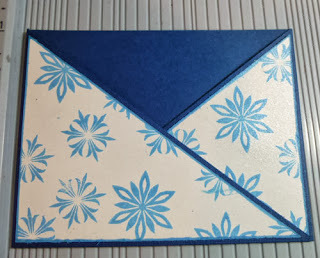 Adhere the white panels to the card, overlapping and adhering together to create the envelope. Cut a panel of white cardstock to fit inside. So are you ready to Hooooooooooooooooooooooop? Here’s the list – enjoy! Thanks for stopping by today and remember to leave a comment at every stop along the hop to be entered for a chance to win some Clearsnap products.